Airliners are not supposed to just drop out of the sky. For the second time in nearly as many months, an Airbus A320 has fallen from altitude and crashed resulting in the deaths of all aboard. The latest accident occurred over the south of France. Germanwings 9525, enroute from Barcelona to Dusseldorf with 144 passengers and 6 crew, had just levelled off at 38,000 ft when after a minute or so it started a descent. In the 8 minutes between the start of the descent and the impact of the aircraft into the Alps, no communications were heard from the cockpit crew in spite of multiple air traffic control attempts. The descent, which averaged about 3300 ft per minute is not unusually steep for an airliner. The aircraft also maintained it's flight planned course during the descent suggesting that some measure of automation was still functioning. The wreckage is in a remote mountainous area in the French Alps and will present serious difficulties in recovery efforts. There are no expectations of finding survivors due to the violent nature of the impact into steep terrain. 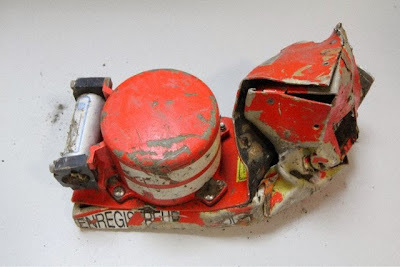 The cockpit voice recorder (CVR) has been recovered and while damaged, has been able to have audio files retrieved by French accident investigators. The flight recorders have not as of yet been located. At this point, speculation is running rampant but generally pointing in the direction of some sort of loss of cabin pressure resulting in the incapacitation of the crew. This would explain the lack of communication with the pilots. Loss of pressurization at 38,000 ft (FL380 in airline jargon) would result in what's known as a "time of useful consciousness" or TUC of about 20 to 30 seconds. That means that the pilots would have about 20 seconds to get their oxygen masks on and to start a descent before succumbing to hypoxia. Loss of cabin pressurization was the cause of the crash of Helios 522, a Greece based airliner in 2005, and also the death of golfer Payne Stuart when the Lear Jet he was riding in lost pressurization. Currently there appears to be no suspicion by investigating authorities of terrorism or foul play. Witnesses have reported that the aircraft appeared intact and flying normally except for its low altitude. This would seem to at least preclude an on board explosion. Any theories given at this early stage in the investigation will be grounded in speculation at least until the CVR transcript can be analyzed or the flight data recorder is found. UPDATE: The New York Times is reporting tonight that the CVR indicates that the first officer exited the cockpit at cruise and was not able to re-enter. This development changes the fundamental nature of the investigation. Payne Stewart not Stewart Payne.